This is termite swarm season. Call us immediately and we will send one of our termite inspectors out for a free inspection. Real estate transactions are the focus of our business. In real estate, time is of the essence, our goal is next day service. Our inspectors do not receive commission, they are paid a salary to perform accurate inspections. We are proud to have many of the leading Realtors in the greater Sacramento area as our clients. We provide pest inspections for many mortgage companies in the area for refinancing loans. We have the NPMA form required for VA loans. We offer the fastest and most readable termite inspections in the area. We automatically send copies of reports to your escrow officer. We work with all the major relocation companies. We know what it takes to close your escrow! 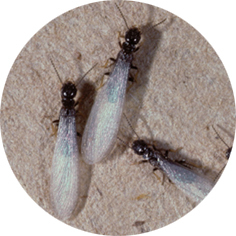 The California Structural Pest Control Board would like us to inform you that while we offer a number of ways to eliminate drywood termites and wood boring beetles due to recent advances in pesticides, the only sure way to eliminate every last insect is to fumigate the structure. While we can arrange to have your building fumigated, the actual fumigation is subcontracted to another pest control company, most likely Nor-Cal Pest Control, a wholesale Sacramento pest control company that performs fumigations in Sacramento and the neighboring counties of Northern California.